This week’s electric vehicle is an electric motorcycle by Lighting. Lighting created their first lithium sport bike in 2006 and have been working hard to update the technology ever since. Richard Hatfield, the company’s CEO, says that he “wanted to build something that equaled or rivaled the best gas bikes out there.” And he definitely did just that. The Lighting LS-218 is the world’s fastest production electric motorcycle. The bike holds 3 land speed records at Bonneville, where it topped out around 218 miles per hour. This speed is what led to its name as the LS-218. 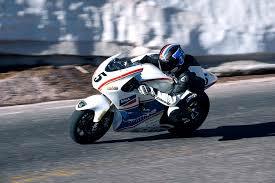 In 2013, the bike went up against some of the fastest gas powered motorcycles in a race on Pike’s Peak, and not only could the bike compete with its ICE rivals, but actually won the race! This is the fastest legal street bike in the world, and Lightning is eager to make it even faster. If that sounds exciting to you, here’s some more specs on it: It can go from 0-60 mph in 2 seconds, has about 200 horsepower, and 168 ft-lb of torque! For comparison, the highest torque in a gas powered motorcycle is 163 ft-lb on the Triumph Rocket III. The LS-218 is able to have such a high torque because of the way electric motors work. The peak torque comes from zero rpm and will drop as revs rise. The highest horsepower in a gas powered motorcycle is 310 hp on the Kawasaki Ninja H2R, (which coincidentally is the only motorcycle to have beaten the LS-218’s record at 220 mph). After this, the rest of the top ten powerful gas bikes have values between 200 and 230 hp. Even with an electric powered system, this bike has the highest torque of all production bikes, electric or not, and has a power that is comparable to its gas powered competitors. While the speed and power are comparable to a gas powered bike, the maintenance and noise level associated with the LS-218 are far superior. Since the motorcycle does not have an internal combustion engine, the only noise that comes from it is from a moving chain. It is remarkably quieter than the loud motorcycles we see on the road today; so quiet that you may not even realize it is going by. With far less moving parts, the bike will show a reduction in maintenance costs. The vehicle uses regenerative braking, which greatly reduces the wear on the brakes, making them last a lot longer. With only one gear and no clutch, the vehicle minimizes the effects of friction. There is also no need for oil changes, as the battery does not use the oil that a combustion engine does. With a range of approximately 100 miles on the highway, this electric motorcycle is perfect for cruising and fulfilling your need for speed. Unfortunately, the motorcycle is a bit pricey, coming in around $40 thousand before incentives, and Lightning is planning on increasing the price when they start mass production. However, this is an extremely reasonable price when you look at the shear awesomeness of this machinery. This electric motorcycle illustrates the movement of the electric vehicle market, and shows that electric motorcycles can be just as fun, if not more fun, than gas powered vehicles. Even if you’re an electric bike skeptic, the LS-218 suggests there might be a very bright future in battery-powered bikes.